Times New Roman is a serif typeface designed for use in body text. It was commissioned by the British newspaper The Times in 1931 and conceived by Stanley Morison, the artistic advisor to the British branch of the printing equipment company Monotype, in collaboration with Victor Lardent, a lettering artist in the Times' advertising department. Although no longer used by The Times, Times New Roman is still very common in book and general printing. It has become one of the most popular and influential typefaces in history and a standard typeface on desktop computers. Times New Roman's creation took place through the influence of Stanley Morison of Monotype. Morison was an artistic director at Monotype, historian of printing and informal adviser to The Times. Asked to advise on a redesign, he recommended that they change their text typeface from a spindly and somewhat dated nineteenth-century face to a more robust, solid design, returning to traditions of printing from the eighteenth century and before. [a][b] This matched a common trend in printing tastes of the period. The new face was drawn by Victor Lardent, an artist from the advertising department of The Times, with Morison consulting, before refinement by the Monotype drawing office. [c] Morison proposed an older Monotype typeface named Plantin as a basis for the design, and Times New Roman mostly matches Plantin's dimensions. The main change was that the contrast between strokes was enhanced to give a crisper image. As a typeface designed for newspaper printing, Times New Roman has a high x-height, short descenders to allow tight linespacing and a relatively condensed appearance. [d] The new design made its debut in The Times on 3 October 1932. After one year, the design was released for commercial sale. 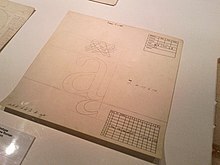 Although Morison may not have literally drawn the design, his influence on its concept was sufficient that he felt that he could take credit for it as "my one effort at designing a font". [e] In Times New Roman's name, Roman is a reference to the regular or roman style (sometimes also called Antiqua), the first part of the Times New Roman family to be designed. Roman type has roots in Italian printing of the late 15th and early 16th centuries, but Times New Roman's design has no connection to Rome or to the Romans. The Times stayed with Times New Roman for 40 years, but new production techniques and the format change from broadsheet to tabloid in 2004 have caused it to switch typeface five times from 1972 to 2007. However, all the new fonts have been variants of the original New Roman typeface. Once released for commercial sale, Times New Roman became extremely successful, becoming Monotype's best-selling typeface of all time in metal type. Twenty-two lines in Times New Roman compared to its predecessor "modern" serif font. [f] Times appears larger on the page, with tighter linespacing and more solid in appearance. A digitisation of Times New Roman below the three typefaces originally considered as a basis for the Times project: Perpetua, Baskerville and Plantin. Times is most based on Plantin, but with the letters made taller and its appearance "modernised" by adding eighteenth- and nineteenth-century influences, in particular enhancing the stroke contrast. Compared to Baskerville and Perpetua, the x-height is higher and the letters narrower. A Ludlow Typograph specimen of Times New Roman Type Specimen from the metal type period. The design was altered in smaller sizes to increase readability, particularly obvious in the widened spacing of the six and eight point samples at centre right of the diagram. The hollows at the top of upstrokes are also not seen in the standard digitisations. Times New Roman has a robust colour on the page and influences of European early modern and Baroque printing. The design is slightly condensed, with short ascenders and descenders and a high x-height (tall lower-case letters), all effects that save space and increase clarity. The roman style of Plantin was loosely based on a metal type created in the late sixteenth century by the French artisan Robert Granjon and preserved in the collection of the Plantin-Moretus Museum of Antwerp. This style is sometimes categorised as part of the "old-style" of serif fonts (from before the eighteenth century). [g] (The 'a' of Plantin was not based on Granjon's work: the sheet from the Plantin-Moretus Museum used as a specimen for Monotype to use in designing Plantin had a substitute 'a' cut later.) Indeed, the working title of Times New Roman was "Times Old Style". However, Times New Roman modifies the Granjon influence further than Plantin due to features such as its 'a' and 'e', with very large counters and apertures, its ball terminal detailing and an increased level of contrast between thick and thin strokes, so it has often been compared to fonts from the late eighteenth century, the so-called 'transitional' genre, in particular the Baskerville typeface of the 1750s. Historian and sometime Monotype executive Allan Haley commented that compared to Plantin "serifs had been sharpened...contrast was increased and character curves were refined," while Lawson described Times's higher-contrast crispness as having "a sparkle [Plantin] never achieved." 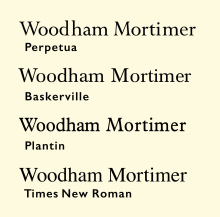 Other changes from Plantin include a straight-sided 'M' and 'W' with three upper terminals not Plantin's four, both choices that move away from the old-style model. Rather than creating a companion boldface with letterforms similar to the roman style, Times New Roman's bold has a different character, with a more condensed and more upright effect caused by making the horizontal parts of curves consistently the thinnest lines of each letter, and making the top serifs of letters like 'd' purely horizontal. This effect is not found in sixteenth-century typefaces (which, in any case, did not have bold versions); it is most associated with Didone type of the early nineteenth century (and with the more recent 'Ionic' styles of type influenced by it that were offered by Linotype, discussed below). Some commentators have found Times' bold unsatisfactory and too condensed, such as Walter Tracy. The development of Times New Roman was relatively involved due to the lack of a specific pre-existing model – or perhaps a surfeit of possible choices. Morison wrote in a memo that he hoped for a design that would have relatively sharp serifs, matching the general design of the Times' previous font, but on a darker and more traditional basic structure. Bulked-up versions of Monotype's pre-existing but rather dainty Baskerville and Perpetua typefaces were considered for a basis, and the recent Legibility Group designs from Linotype, which had attracted considerable attention (and may have influenced the decision to carry out a redesign), were also examined. (Perpetua, which Monotype had recently commissioned from sculptor Eric Gill at Morison's urging, is considered a 'transitional' design in aesthetic, although it does not revive any specific model.) Walter Tracy, who knew Lardent, suggested in the 1980s that "Morison did not begin with a clear vision of the ultimate type, but felt his way along." Walter Tracy and James Moran, who discussed the design's creation with Lardent in the 1960s, found that Lardent himself had little memory of exactly what material Morison gave him as a specimen to use to design the typeface, but he told Moran that he remembered working on the design from archive photographs of vintage type; he thought this was a book printed by Christophe Plantin; Tracy suggests that this actually might have been the same specimen of type from the Plantin-Moretus Museum that Plantin had been based on. (Although based on a type in the collection of the Plantin-Moretus Museum, which preserves much of the collection of sixteenth-century printer Christophe Plantin, Plantin is actually based specifically on a Granjon font for which matrices (moulds) only arrived in the collection after Plantin's death.) The sharpened serifs somewhat recall Perpetua, although Morison's stated reason for them was to provide continuity with the previous Didone design and the crispness associated with the Times' printing; he also cited as a reason that sharper serifs looked better after stereotyping or printed on a rotary press. Morison's several accounts of his reasoning in designing the concept of Times New Roman were somewhat contradictory and historians of printing have suggested that in practice they were mostly composed to rationalise his pre-existing aesthetic preferences. After Morison's death Allen Hutt, who had been Monotype's newspaper printing consultant, went so far as to describe his unsigned 1936 article on the topic as "rather odd…it can only be regarded as a piece of Morisonian mystification". Lardent's original drawings are according to Rhatigan lost, but photographs exist of his drawings. Rhatigan comments that Lardent's originals show "the spirit of the final type, but not the details." The design was adapted from Lardent's large drawings by the Monotype drawing office team in Salfords, Surrey, which worked out spacing and simplified some fine details. Further changes were made after manufacturing began (the latter a difficult practice, since new punches and matrices had to be machined after each design change). A large number of variants of Times were cut during the metal type period, in particular families of titling capitals for headlines. Walter Tracy in Letters of Credit, Allen Hutt and others have discussed these extensively in their works on the family. Monotype also created some caps-only 'titling' designs to match Times New Roman itself, which was intended for body text. These are not sold by Monotype in digital format, although Linotype's Times Eighteen in the same style (see below) is. Times Hever Titling from a Monotype specimen. An elegant titling caps design, quite different from Times New Roman with a Caslon-style A (with a serif at top left of the letter, suggesting a stroke written with a quill) and old-style C and W; Tracy suggests Monotype's previous Poliphilus design as an influence. Named after Hever Castle, the home of the Times' owner Lord Astor. Designed early on, it was used by the Times for section headings. It has not been digitised. A variant intended for book printing, avoiding the slight condensation of the original Times New Roman. Although it was popular in the metal type period for book printing, it was apparently never digitised. Monotype also created a version, series 627, with long descenders more appropriate to classic book typography. Optional text figures were also available. Monotype also produced Series 727, in which the heavier strokes of upper-case letters were made slightly thinner. This was done to produce a lighter effect in which capital letters do not stand out so much, and was particularly intended for German use, since in the German language capitals are far more common since they appear at the start of each noun. Series 827 modified some letters (notably the R) to correspond to their appearance in other typefaces popular in French printing. This production of what are now called stylistic alternates to suit national tastes was common at the time, and many alternates were also offered for Gill Sans for use in Europe. A modified 4¾ point size of Times Roman was produced by Monotype for use in printing matter requiring a very small size of type. Listed as Times Newspaper Smalls, available as either Series 333 or 335, it was also referred to by the name Claritas. This is a variant designed for printing mathematical formulae, using the 4‑line system for mathematics developed by Monotype in 1957. This modified version of Times Roman was designed for use as part of Monotype's 4-line Mathematics system. The major changes to the Times Roman typeface itself were a reduction in the slope of italic characters to 12 degrees from 16 degrees, so as to reduce the need for kerning, and a change in the form of italic v and w so that italic v could be more easily distinguished from a Greek nu. The 4-line system involved casting characters for 10-point Times Roman on 6-point bodies. The top of the character would overhang the slug, forming a kern which was less fragile than the normal kerns of foundry type, as it was on a slab of cast metal. This technique had been in previous use on Monotype machines, usually involving double-height matrices, to allow the automatic setting of "advertising figures" (numbers that occupy two or more lines, usually to clearly indicate a price in an advertisement set in small type). This meant that the same matrix could be used for both superscript and subscript numbers. More importantly, it allowed a variable or other item to have both a superscript and a subscript at the same time, one above the other, without inordinate difficulty. Previously, while the Monotype system, due to its flexibility, was widely used for setting mathematical formulas, the typeface Modern Series 7 was usually used for this purpose. 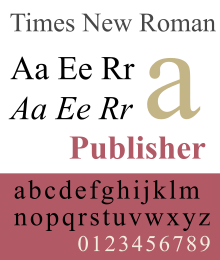 Because of the popularity of Times Roman at the time, Monotype chose to design a variant of Times Roman suited to mathematical composition, and recut many additional characters needed for mathematics, including special symbols as well as Greek and Fraktur alphabets, to accompany the system instead of designing it around the typeface that was being used, for which characters were already available. Matrices for some 700 characters were available as part of Times Roman Series 569 when it was released in 1958, with new characters constantly being added for over a decade afterwards (thus, in 1971, 8,000 characters were included, and new ones were being added at a rate of about 5 per week). A 1943 brochure used by Crowell-Collier, one of the first major American users of Times New Roman, to promote the changeover. Times New Roman's popularity rapidly expanded beyond its original niche, becoming popular in book printing and general publishing. Monotype took advantage of this popularity by commissioning a widened version, Series 427, for book publishing, although many books ultimately used the original version. An early use of Times New Roman outside its origin was by Daniel Berkeley Updike, an influential historian of printing with whom Morison carried an extensive correspondence. Impressed by the design, he used it to set his book Some Aspects of Printing, Old and New. It then was chosen by the Crowell-Collier magazines Woman's Home Companion and then its sister publications such as Collier's. A brochure was published to mark the change along with a letter from Morison hoping that the redesign would be a success. Walter Tracy, who worked on a redesign, however noted that the design's compression and fine detail extending to the edge of the matrices was not ideal in the aggressive conditions of most newspaper printing, in which the Times was unusual for its particularly high standard of printing suiting its luxury market. Users found that in the hot metal period it was common for the molten metal to rapidly eat through the matrices as type was being cast, and so it did not become popular among other newspapers: "Times Roman achieved its popularity chiefly in general printing, not in newspaper work." He described it as particularly used in "book work, especially non-fiction" such as the Encyclopaedia Britannica. Allen Hutt also commented that Times New Roman's relative condensation was less useful than might be expected for newspaper printing, since in a normal newspaper column frequent paragraph breaks tend to provide area that can absorb the space of wider letters without increasing the number of lines used–although The Times, whose house style in the 1930s was to minimise the number of paragraph breaks, was an exception to this. Times New Roman remains popular in publishing, helped by the extremely large range of characters available for international and mathematics printing. For example, the American Psychological Association suggests using Times New Roman in papers written in its APA style. Working drawings for a Linotype release of "Times Roman". Various accents are drawn together on the same sheet. 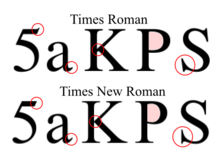 Some differences between Linotype's Times Roman and Monotype's Times New Roman typefaces. Despite Monotype's key role in creating Times New Roman, its rival Linotype rapidly began to offer the design; The Times used Linotype equipment for much of its production. Linotype referred to the design as Times or Times Roman. Monotype and Linotype have since merged, but slight differences have split the lineage of Times into two subtly different designs. Linotype licensed its version to Xerox and then Adobe and Apple, guaranteeing its importance in digital printing by making it one of the core fonts of the PostScript page description language. Microsoft's version of Times New Roman is licensed from Monotype, hence the original name. For compatibility, Monotype had to subtly redraw their design to match the widths from the Adobe/Linotype version. Versions of Times New Roman from Monotype exist which vary from the Linotype metrics (i.e. not the same as the version for Microsoft). Linotype applied for registration of the trademark name Times Roman and received registration status in 1945. In the 1980s, there was an attempt by a group of entrepreneurs to seek from Rupert Murdoch, who owned The Times, the right to use the Times Roman name; separately, a legal action was also initiated to clarify the right of Monotype to use the name in the US despite Linotype's registration. As a result of legal action, Linotype and its licensees continued to use the name Times Roman, while Monotype and its licensees used the name Times New Roman. Monotype sells a wider range of styles and optical sizes for Times New Roman than are offered with Windows, in order to meet the needs of newspapers and books which print at a range of text sizes. Its current release includes Regular, Medium, Semi Bold and Bold weights with matching italics, Extra Bold, Condensed (in regular, italic and bold), Seven (for smaller text, in regular, italic, bold and bold italic) and Small Text (for very small text, in regular, italic and bold). This is a version based on fonts released with Windows Vista. It includes fonts in WGL character sets, Hebrew and Arabic characters. Similar to Helvetica World, Arabic in italic fonts are in roman positions. Times Ten is a version specially designed for smaller text (12 point and below). It features wider characters and stronger hairlines. In 2004 prominent typeface designer Erik Spiekermann said that he believed that it was the best Times New Roman digitisation then available. Times Eighteen, a headline version for point sizes of 18 and larger. The characters are subtly condensed and the hairlines are finer. The current version has no italics, but does have a lower case (whereas some Times titling fonts were capitals only). Times Europa Office, a 2006 adaptation of the Times newspaper's 1972 design Times Europa (see below). This is a complete family of designs intended for use on poor-quality paper. The updating, created by Akira Kobayashi, contains tabular numbers, mathematical signs, and currency symbols. Each character has the same advance width in all the fonts in the family so that changing from regular to bold or italic does not affect word wrap. 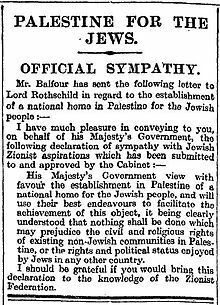 The Times' previous typeface from an article describing the Balfour Declaration in 1917. Times Europa was designed by Walter Tracy in 1972 for The Times, as a sturdier alternative to the Times font family, designed for the demands of faster printing presses and cheaper paper. The typeface features more open counter spaces and a more strongly contrasting, calligraphic italic. It has been released commercially by Adobe, among others, recently in an updating by Linotype. Times Roman replaced Times Europa on 30 August 1982. Times Classic first appeared in 2001. Designed as an economical face by the British type team of Dave Farey and Richard Dawson, it took advantage of the new PC-based publishing system at the newspaper, while obviating the production shortcomings of its predecessor Times Millennium. The new typeface included 120 letters per font. Initially the family comprised ten fonts, but a condensed version was added in 2004. During the Times New Roman period The Times also sometimes used Perpetua Titling, also from Monotype, and one of Morison's favourite type designs from his work at Monotype. 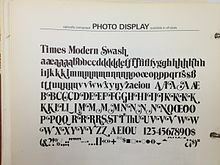 Times Modern Swash, an exaggerated and unauthorised display adaptation of Times from the phototypesetting period. In 1994 the printing historian Mike Parker published claims that the design of Times New Roman’s roman or regular style was based on a 1904 design of William Starling Burgess. This theory remains controversial. Parker and his friend Gerald Giampa, a Canadian printer who had bought up the defunct American branch of Lanston Monotype, claimed that, in 1904, Burgess created a type design for company documents at his shipyard in Marblehead, Massachusetts, and hired Lanston Monotype to issue it. However, Burgess abandoned the idea and Monotype shelved the sketches, ultimately reusing them as a basis for Times New Roman. Giampa claimed that he stumbled upon original material in 1987, after he had purchased Lanston Monotype, and that some of the papers that had been his evidence had been lost in a flood at his house, while Parker claimed that an additional source was material in a section of the Smithsonian now closed due to asbestos contamination. Giampa asked Parker to complete the type from the limited number of surviving letters, which was issued in June 2009 by Font Bureau under the name of 'Starling'. Reception to the claims was sceptical, with dismissal from Morison's biographer Nicolas Barker and Luc Devroye among others; Barker suggested that the material had been fabricated in order to aid Giampa in embarrassing Monotype's British branch, while Devroye suggested that the claim had begun as a prank. In 2010, writer Mark Owens described Parker's article in retrospect as "the scantest of evidence" and a "fog of irrelevant details". [m] Monotype executive Dan Rhatigan described the theory as implausible in 2011: "I'll admit that I tend to side with the more fully documented (both in general, and in agreement with what little I can find within Monotype to support it) notion that Times New Roman was based on Plantin...I won't rule out the possibility that Starling Burgess drew up the concept first, but Occam's razor makes me doubt it." The Times Online web site credits the design to "Stanley Morrison, Victor Lardent and perhaps Starling Burgess". Because of its popularity, the typeface has been influential in the subsequent development of a number of serif typefaces both before and after the start of the digital-font era. Times Modern was a condensed and bold display variant published by, among others, Elsner+Flake. It was withdrawn from sale due to trademark disputes with the Times newspaper, which owns its own unrelated design named 'Times Modern' (see above). CG Times is a variant of Times family made by Compugraphic Corporation foundry. Pelham is a version of Times Roman by DTP Types of Britain, which also cut an infant version with single-story versions of the letters a and g.
Press Roman, a version of Times New Roman typed on a premium IBM typewriter. Kris Sowersby's popular Tiempos family is a loose Times New Roman revival; it was created for a Spanish newspaper ('tiempo' is Spanish for 'time'). URW++ produced a version of Times New Roman called Nimbus Roman in 1982. Nimbus Roman No9 L, URW's PostScript variant, was released under the GNU General Public License in 1996, and available in major free and open source operating systems. [o] Like Times New Roman, many additional styles of Nimbus Roman exist that are only sold commercially, including condensed and extra-bold styles. URW also developed Nimbus Roman No. 4, which is metrically compatible with the slightly different CG Times. A standard Times New Roman digitisation compared to the STIX Two project, an open-source typeface for mathematics based on Times's smaller metal point sizes. STIX Two has a higher x-height and a reduction in fine detail. The STIX Fonts project is a four-style set of open-source fonts. They were created for scientific publishing by the Scientific and Technical Information Exchange consortium of publishers, but are also very suitable for general use, including Greek and Cyrillic support. The original version is installed by default on Mac OS X, and adapted as XITS. In 2016, a completely redesigned version was released by Ross Mills and John Hudson of Tiro Typeworks. Unlike the previous version, it is an original design loosely inspired by a smaller 10 point size of Times New Roman, with a higher x-height than Monotype's Times digitisation. Liberation Serif is metrically equivalent to Times New Roman. It was developed by Ascender Corp. and published by Red Hat in 2007 under the GPL license with some exceptions. It is used in some GNU/Linux distributions as a default font replacement for Times New Roman. Widths aside, it does not particularly resemble Times New Roman, being much squarer in shape with less fine detail and blunt ends rather than ball terminals. Google's Tinos in the Croscore fonts package is a derivative of Liberation Serif. Bitstream Cyberbit is a roman-only font released by Bitstream for non-commercial use, with European alphabets based on Times New Roman. It has an expanded character range intended to cover a large proportion of Unicode for scholarly use. Bitstream no longer offers the font, but it remains downloadable from the University of Frankfurt. ^ The Times's previous font was a Didone or Modern design; James Mosley reports that it is the face Monotype sold as Series 7 or "Modern Extended", based on typefaces by Miller and Richard. Now little-known, the success of its replacement has led to it sometimes being called Times Old Roman in reference to its successor and a famous cover of Monotype's trade journal Monotype Recorder which presented it under this name. Computer Modern is somewhat similar. Fonts of its kind were standard in nineteenth- and early-twentieth century newspaper printing and beyond; digital period typeface designer Tobias Frere-Jones wrote that he kept his family, Exchange, designed for the Wall Street Journal based on the nineteenth-century model as it "had to feel like the news." ^ "The Changing Newspaper" articles in the Monotype Recorder are unsigned, but Monotype's newspaper consultant Allen Hutt, who co-authored the issue, attributes them to Morison. ^ Exactly what direction Morison gave Lardent is uncertain: Morison said that he had given Lardent basic drawings which Lardent worked up; Lardent that Morison had only given him basic directions and some photographs as a model; see below. ^ While Times is often described as being quite "condensed" this is relative to its high x-height: typefaces with lower x-height, such as many versions of Garamond, Caslon and Bembo, are narrower at equalised point or cap height. Although Hutt, and most other authors, describe Times New Roman as having a higher x-height than Plantin, Tracy reports based on published Monotype dimensions that in the original small metal-type sizes the difference was not great. ^ Spelling modernised. Morison wrote "fount", the usual spelling in British English at the time. ^ "Modern" in typography is a generic term referring to designs in the modern or Didone style of the nineteenth century. ^ Times New Roman was called "Times Old Style" in an early stage of its development. ^ Morison continued: "– Mr. Goudy for instance." This refers to Frederic Goudy, one of the leading American type designers of the period. Morison considered his very organic tastes in letter design somewhat florid and self-indulgent. ^ It will be noted in the roman style that the high serifs of the 'v' do not sit well with the lower shape of the 'i'. In his commentary on Times, Walter Tracy commented that the designers should have tested the font using words like 'divide' and 'jump' to avoid this. ^ Dreyfus shows proofs of the experimental recut of Perpetua with shortened descenders to allow tighter linespacing. Morison later commented that "it stared at the reader". ^ Monotype's article on the creation of the new type provides a side-by-side comparison of text in both typefaces. ^ Briem has written that a complicated three-way lawsuit followed in which Patel unsuccessfully claimed to have co-designed Times Millennium himself. ^ Among the few prominent figures in typography to express even qualified support for the idea was Tiro Typeworks owner John Hudson, Giampa's neighbour. He wrote in 2008 that he had examined Giampa's claimed patterns and that they looked as if they were made using an early Monotype production process obsolete by 1931: "the material evidence of the two-part patterns and their numbering -- if they are genuine --, suggests very strongly a design that significantly pre-dates 1931...The patterns are either deliberate hoax or they are historical artefacts" and that he was "unconvinced that this is a hoax." The claims did convince prominent type designer Walter Tracy, who had written a major analysis of Times New Roman's genesis in his book Letters of Credit; however he died in April 1995, before Parker's finalised publication, and did not live to see the extensive rebuttals. ^ The system returned to public attention in 2004, during the Killian documents controversy, when some documents apparently from the 1970s and presenting the future U.S. president George W. Bush's somewhat chequered military service in an unfavourable light were presented by the American news network CBS. The documents were typeset in a form of Times New Roman. As the documents looked unlike most typewritten documents, having proportional spacing rather than the monospacing of almost all typewritten documents, some defenders of the documents suggested that they might have been typed using this method. It is now accepted that they were forged on a modern computer, according to digital font expert Thomas Phinney in the Linotype version of Times New Roman. ^ This was later adapted in versions including FreeSerif, TeX Gyre Termes and TeX Gyre Termes Math. ^ Loxley, Simon (2006). Type: the secret history of letters. I. B. Tauris & Co. Ltd. pp. 130–131. ISBN 1-84511-028-5. ^ a b c d e f Hutt, Allen (1970). "Times Roman: a re-assessment". Journal of Typographic Research. 4 (3): 259–270. Retrieved 5 March 2017. ^ a b c d Dreyfus, John (1973). "The Evolution of Times New Roman". The Penrose Annual. 66: 165–174. ^ Farey, Dave (2014). "A Life and Times, Part 1". Ultrabold (16): 16–25. ^ Farey, Dave (2014). "A Life and Times, Part 2". Ultrabold (15): 3–13. ^ a b Rhatigan, Dan. "Time and Times again". Monotype. Retrieved 28 July 2015. ^ Carter, H. G. (2004). ‘Morison, Stanley Arthur (1889–1967)’. Oxford Dictionary of National Biography,. rev. David McKitterick. Oxford University Press. ^ Mosley, James. "Comments on Typophile thread". Typophile. Archived from the original on 12 June 2012. Retrieved 27 July 2015. ^ a b Rhatigan, Dan. "It was never called Times Old Roman". Ultrasparky. Retrieved 27 July 2015. ^ Frere-Jones, Tobias. "Decompiled & Remixed History: The Making of Exchange". Frere-Jones Type. Retrieved 1 August 2017. ^ a b c d Morison, Stanley. "Changing the Times". Eye. Retrieved 28 July 2015. ^ a b Morison, Stanley (1936). "Monotype Recorder: The Changing Newspaper" (PDF). Monotype Recorder. 35 (1). ^ a b c d e f g h i j Walter Tracy (January 2003). Letters of Credit: A View of Type Design. D.R. Godine. pp. 80–82, 183–5, 194–209. ISBN 978-1-56792-240-0. ^ Clarke, C.F.O. "The Times: A Revolution in Newspaper Printing". Graphis. pp. 362–375. ^ a b c Morison, Stanley (7 June 1973). A Tally of Types. CUP Archive. pp. 22–24, 106, 124 etc. ISBN 978-0-521-09786-4. ^ a b Morison, Stanley; Updike, Daniel Berkeley. Stanley Morison & D. B. Updike: Selected Correspondence. pp. 184–6. ^ William E. Ryan; Theodore E. Conover (2004). Graphic Communications Today. Cengage Learning. pp. 72–81. ISBN 0-7668-2075-0. ^ Badaracco, Claire (1991). "Innovative Industrial Design and Modern Public Culture: The Monotype Corporation, 1922–1932" (PDF). Business & Economic History. Business History Conference. 20 (second series): 226–233. Retrieved 19 December 2015. ^ Whittington Press [@whittingtonpres] (14 April 2016). "Sales chart of Monotype die cases" (Tweet) – via Twitter. ^ Printing the Times: A record of the changes introduced in the issue for October 3, 1932. London. 1932. ^ Gaultney, Victor. "Balancing typeface legibility and economy Practical techniques for the type designer". University of Reading (MA thesis). Retrieved 13 October 2017. ^ Haslam, Andrew; Baines, Phil (2005). Type & typography (2nd ed.). London: Laurence King. p. 65. ISBN 978-1-85669-437-7. ^ a b Mann, Meredith. "Where Did Times New Roman Come From?". New York Public Library. Retrieved 2 February 2016. ^ a b Hendrik D. L. Vervliet (2008). The Palaeotypography of the French Renaissance: Selected Papers on Sixteenth-century Typefaces. BRILL. pp. 226–7. ISBN 90-04-16982-2. ^ Mosley, James. "Comments on Typophile thread". Typophile. Retrieved 16 December 2016. The consensus appears to be that not only the wrong-fount a in the cases at Antwerp but also the italic that Monotype adapted for their Plantin (which can be seen on that first page of the 1905 specimen) may be the work of Johann Michael Schmidt (died 1750), also known as J. M. Smit or Smid. ^ Haley, Allan (1992). "Stanley Morison". Typographic Milestones. Hoboken, NJ: John Wiley & Sons. pp. 99–107. ISBN 9780471288947. Retrieved 26 January 2016. ^ Haley, Allen (1990). ABC's of type. Watson-Guptill Publications. p. 86. ISBN 9780823000531. Times looks like Plantin on a diet. ^ Morison, Stanley (2009). "Chapter 8: Leipzig as a Centre of Type-Founding". In McKitterick, David (ed.). Selected essays on the history of letterforms in manuscript and print (Paperback reissue, digitally printed version ed.). Cambridge: Cambridge University Press. pp. 149–170. ISBN 978-0-521-18316-1. ^ Mosley, James (2003). "Reviving the Classics: Matthew Carter and the Interpretation of Historical Models". In Mosley, James; Re, Margaret; Drucker, Johanna; Carter, Matthew (eds.). Typographically Speaking: The Art of Matthew Carter. Princeton Architectural Press. pp. 31–34. ISBN 9781568984278. Plantin was a recreation of one of the old types held at the Plantin-Moretus Museum in Antwerp, of which a specimen, printed in 1905, had been acquired by Pierpont on a visit. The type from which the specimen was printed was not only centuries old and worn almost beyond use, but it was contaminated with wrong-font letters (notably the letter ‘a’) and the italic did not even belong to the roman. The revival, derived by Monotype from an indirect and confused original, is [nonetheless] as sound a piece of type-making as was ever created in the 20th century…behind the foggy image of the roman type lies the...'Gros Cicero' Roman of Robert Granjon, acquired by the Plantin printing office after the death of its founder. ^ Busic-Snyder, Kate Clair, Cynthia (2005). A typographic workbook a primer to history, techniques, and artistry (2nd ed.). Hoboken, N.J.: Wiley. p. 171. ISBN 9781118399880. Retrieved 16 January 2016. ^ Horne, Yannis Haralambous ; translated by P. Scott (2007). Fonts & Encodings (1st ed.). Sebastopol, Calif.: O'Reilly Media. p. 417. ISBN 9780596102425. Retrieved 26 January 2016. ^ Allan Haley (15 September 1992). Typographic Milestones. John Wiley & Sons. p. 106. ISBN 978-0-471-28894-7. ^ a b c Lawson, Alexander (1990). Anatomy of a Typeface. New York: David R. Godine. pp. 270–294. ISBN 9780879233334. Retrieved 6 March 2016. ^ Tracy, Walter (January 2003). Letters of Credit: A View of Type Design. D.R. Godine. pp. 56–59. ISBN 978-1-56792-240-0. ^ Barr, John (1971). Stanley Morison: A Portrait. British Museum. p. 33. ^ Wardle, Tiffany (2000). The story of Perpetua (PDF). University of Reading. p. 5. Archived from the original (PDF) on 10 November 2006. Retrieved 26 March 2009. ^ Mosley, James. "Eric Gill's Perpetua Type". Fine Print. ^ Simon Loxley (12 June 2006). Type: The Secret History of Letters. I.B.Tauris. pp. 134–. ISBN 978-1-84511-028-4. ^ Alas, Joel. "The history of the Times New Roman typeface". Financial Times. Retrieved 16 January 2016. ^ Middendorp, Jan (2004). Dutch type. Rotterdam: 010 Publishers. p. 94. ISBN 9789064504600. Retrieved 26 January 2016. ^ a b Miklavčič, Mitja (2006). "Three chapters in the development of Clarendon/Ionic typefaces" (PDF). MA Thesis (University of Reading). Archived from the original (PDF) on 25 November 2011. Retrieved 14 August 2015. ^ Coles, Stephen. "Times Bold Modified". Flickr. Retrieved 26 January 2016. [Writing on cold type rereleases of Times New Roman by Berthold]: To me, the sources for both Monotype and Linotype digital versions…really suffer from the condensed bold…in fact, many Bold letters are actually narrower, resulting in counters reduced to mere slits in some cases. Times 421 [an alternative release in the 1970s by Berthold] is not compromised in this way and the result is much more clear and confident. Yes, it takes up more space; but this style needs to — especially for text. [It] also maintains the angled stress of the regular (327), while Times New Roman Bold is forced into an unrelated vertical stress…I don’t know if this design originated at Monotype or if it’s a Berthold invention. It isn’t a match, but it does seem similar to the variant used by Stanley Morison in his essay on Times for A Tally of Types(1953), which he describes as “a wide version, more suited for longer lines.” Jaspert, Berry and Johnson show that in Encyclopaedia of Typefaces as “Times Wide” (Series 427). Another possible link to this Berthold design is mentioned by Tracy in Letters of Credit: “This disparity in style between the roman and bold was evidently something the German Linotype company thought should be eliminated. In the version of Times Roman they issued in 1935, first called Neue Romanisch but then named Toscana, the bold lowercase was redesigned in the ‘old style’ mode. The idea of harmonising the bold with the roman was logical; the actual execution, especially the character spacing, was not well done. The type soon disappeared." ^ Coles, Stephen; Shinn, Nick; Phinney, Thomas. "Why does the digital Times New Roman seem to consist of two different typefaces? (discussion)". Quora. Retrieved 6 September 2017. ^ Lang, Peggy (1946). "Times Roman: A Revaluation". Alphabet & Image: 5–17. ^ a b Barker, Nicolas (1972). Stanley Morison. pp. 271–302. ^ Cees de Jong; Alston W. Purvis; Friedrich Friedl (2005). Creative Type: A Sourcebook of Classic and Contemporary Letterforms. Inmerc. p. 355. ISBN 978-90-6611-250-6. ^ a b Crutchley, Brooke (1990). "From a Cambridge Diary". Matrix. Whittington Press. 10. ^ Pimlott, Herbert (February 2013). "The Radical Type? G. Allen Hutt, the Communist Party and the politics of journalistic practice". Journalism Practice. 7 (1): 81–95. doi:10.1080/17512786.2012.685556. ^ a b c "The Times: New roman and related founts". Times/Monotype. Archived from the original on 16 September 2015. Retrieved 16 September 2015. ^ a b "Linotype Times Eighteen". MyFonts. Retrieved 14 July 2015. ^ Savoie & Hudson. "Comments on Typophile thread". Typophile. Archived from the original on 17 July 2014. Retrieved 16 September 2015. ^ "Typographic Problems of the Illustrated Book" (PDF). Monotype Recorder. 37 (2): 31. 1938. Some types look larger, size for size, than others, because they have unusually short descenders and ascenders. This allows more room for the 'x' or the middle part of the lower-case [but] a 'large x' is bound to waste space horizontally...the imperceptible condensation of Monotype Times New Roman puts it in a class by itself as a news face. In the wider book measure, however, condensation is no asset. ^ a b c Williamson, Hugh (1956). Methods of Book Design. pp. 102–3. ^ "Modifications and extensions of a single series" (PDF). Monotype Recorder. 40 (3): 14. 1956. Retrieved 27 July 2015. ^ Rhatigan, Daniel. "The Monotype 4-Line System for Setting Mathematics". Type Culture. Retrieved 17 August 2018. ^ Rhatigan, Daniel. "Three typefaces for mathematics" (PDF). University of Reading (MA thesis). Retrieved 2 February 2016. ^ a b Heller, Steven. "Happiness is Times New Roman". Print magazine. Retrieved 15 December 2016. ^ Lewis Blackwell (2004). 20th-century Type. Laurence King Publishing. pp. 76–9. ISBN 978-1-85669-351-6. ^ Lawson, Alexander S. "D.B. Updike Set Standard of Great Craftsmanship". The Alexander S. Lawson Archive. Retrieved 15 December 2016. ^ Lawson, Alexander S. "Stanley Morison: Significant Historian (obituary)". The Alexander S. Lawson Archive. Archived from the original on 27 May 2016. Retrieved 14 May 2016. ^ Alexander S. Lawson (January 1990). Anatomy of a Typeface. David R. Godine Publisher. pp. 270–294. ISBN 978-0-87923-333-4. ^ "Crowell-Collier adopts a Type Developed by London Times". Inland Printer and American Lithographer. 111. ^ Allen, Hutt (1960). Newspaper Design. Oxford University Press. pp. 58–61, 106–8. ^ Bergmann, Christopher. "Es gilt das gesprochene Wort: Schriftarten für IPA-Transkriptionen". Isoglosse. Retrieved 14 November 2018. ^ Lee, Chelsea. "Fonts of Knowledge". APA Style Blog. American Psychological Association. Retrieved 14 November 2018. ^ "Pencil To Pixel – Monotype". Charli Luc. Retrieved 2 April 2019. ^ a b Strizver, Ilene. "TypeTalk: Times Roman vs Times New Roman". CreativePro.com. ^ Sluiter, Matthijs; Hardwig, Florian. "Low←tech Magazine website". Fonts in Use. Retrieved 2 April 2019. ^ a b Charles Bigelow (1994). "Times (New) Roman and its part in the Development of Scalable Font Technology". Retrieved 4 July 2011. ^ Shaw, Paul. "Some history about Arial". Paul Shaw Letter Design. Retrieved 22 May 2015. ^ Simonson, Mark. "Monotype's Other Arials". Mark Simonson Studio. Retrieved 14 July 2015. ^ "Monotype Library: Times New Roman". Monotype. Retrieved 14 July 2015. ^ a b Times New Roman, v. 6.96 (Font digitisation). ^ Thiago; Hardwig, Florian. "New Roman Times – Camper Van Beethoven". Fonts in Use. Retrieved 2 April 2019. ^ "Times New Roman OS". Linotype. Monotype. Retrieved 14 July 2015. ^ "Linotype Times Ten". MyFonts. Retrieved 14 July 2015. ^ "Adobe Times Ten". MyFonts. Retrieved 14 July 2015. ^ Shaw, Paul. "State Department bans Courier New 12, except for treaties". AIGA. Retrieved 27 December 2018. ^ "Times Europa Office Font Family". Linotype.com. Retrieved 21 September 2013. ^ "Adobe Times Europa". MyFonts. Retrieved 14 July 2015. ^ a b c "After 221 years, the world's leading newspaper shows off a fresh face". Thetimes.co.uk. 20 November 2006. Retrieved 21 September 2013. ^ Briem, Gunnlaugur. "BriemTimes:". Gunnlaugur SE Briem. Retrieved 27 July 2015. ^ "Typography of News Bigger, faster, better". Fontshop.com. Retrieved 21 September 2013. ^ "Neville Brody's Research Studios Creates New Font and Design Changes for The Times as Compact Format Continues to Attract Loyal Readership". LONDON: Prnewswire.co.uk. 15 November 2006. Retrieved 21 September 2013. ^ Formby-Jackson, Alan. "A conversation with Times Modern designer Luke Prowse". Visual Editors. Retrieved 2 April 2019. ^ Parker, Mike (1994). "W. Starling Burgess, Type Designer?". Printing History. 31/32: 52–108. ^ Alas, Joel (1 August 2009). "The history of the Times New Roman typeface". Financial Times. Retrieved 26 August 2009. ^ a b c Loxley, SImon. "Stanley Morison and Times New Roman". Ultrabold. Retrieved 8 March 2016. ^ Barker, Nicolas (2003). "Starling Burgess: No Type Designer". Form and Meaning in the History of the Book : selected essays. London: British Library. pp. 371–390. ISBN 0-7123-4777-1. ^ Devroye, Luc. "William Starling Burgess". Type Design Information. Retrieved 8 March 2016. ^ Owens, Mark (2010). A Note on the Type. Carnegie Museum of Art. pp. 268–270. ^ Hudson, John. "Comments on Typophile thread". Typophile. Retrieved 30 March 2019. ^ Tracy, Walter (1995). "Letters of Credit: A Correction". Journal of the Printing Historical Society: 2–3. ^ "FAQ: infrequently asked questions". Times Online. 25 January 2007. Retrieved 26 August 2009. ^ Coles, Stephen. "Times Modern". Fonts in Use. Retrieved 14 July 2015. ^ Stamm, Swiss Foundation Type and Typography ; edited by Heidrun Osterer and Philipp (2009). Adrian Frutiger typefaces : the complete works (English ed.). Basel: Birkhäuser. p. 192. ISBN 978-3764385811. ^ McEldowney, Dennis (1 October 2013). A Press Achieved: the Emergence of Auckland University Press, 1927-1972. Auckland University Press. pp. 102–5. ISBN 978-1-86940-671-4. ^ Phinney, Thomas (3 August 2006). "Bush Guard memos used Times Roman, not Times New Roman". The Typekit Blog. Retrieved 20 April 2015. ^ Dobbs, Michael; Kurtz, Howard (14 September 2004). "Expert Cited by CBS Says He Didn't Authenticate Papers". The Washington Post. Retrieved 20 February 2007. ^ Sowersby, Kris. "Tiempos Design Information". Klim Type Foundry. Retrieved 21 January 2019. ^ a b "GNU FreeFont - Why do we need free outline UCS fonts?". 4 October 2009. Retrieved 2 July 2010. ^ "Finally! Good-quality free (GPL) basic-35 PostScript Type 1 fonts" (TXT). Retrieved 6 May 2010. ^ "ghostscript-fonts-std-4.0.tar.gz - GhostScript 4.0 standard fonts - AFPL license". 28 June 1996. Archived from the original (TAR.GZ) on 24 April 2011. Retrieved 6 May 2010. ^ "GNU FreeFont - Design notes". 4 October 2009. Retrieved 2 July 2010. ^ "TeX Gyre Termes — GUST Web Presence". Retrieved 20 May 2018. ^ "README-TeX-Gyre-Termes-Math.txt — GUST Web Presence". Retrieved 6 October 2018. ^ "STIX Project". Scientific and Technical Information Exchange. Retrieved 16 September 2015. ^ "Tweet". Twitter. Tiro Typeworks. Retrieved 10 December 2016. The original STIX fonts were based on a Times New Roman clone. The new #STIX2 faces are redesigned, inspired by 10pt metal Times fonts. ^ Twardoch, Adam. "New "STIX Two" opensource fonts by Tiro: stixfonts.org". Facebook. Retrieved 10 December 2016. The new design is fantastic — it can be described as “the better Times New Roman”. It’s somewhat similar to Times, but with a touch of Fleischmann. Its lower contrast, enlarged x-height and less inclined italic all contribute to superb(!) readability, in both web and print. STIX Text is a neutral, non-invasive text face for continuous reading. 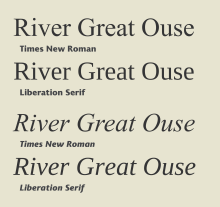 ^ "Overview - liberation-fonts - Pagure". Red Hat pagure. Retrieved 12 February 2018. ^ "Titus Unicode". Department of Empirical Linguistics. University of Frankfurt. Retrieved 22 February 2016. ^ "pub/communicator/extras/fonts/windows". Netscape. Archived from the original on 7 September 2008. Retrieved 22 February 2016. ^ "Titus Unicode". University of Frankfurt. Retrieved 22 February 2016. Wikimedia Commons has media related to Times New Roman. Dates are approximate only. Not all typefaces shown.